He had arrived in Auckland with his parents on the Ironsides in Aug 1864 and established a successful boot factory business. He was superintendent of the United Free Methodist Sunday School in Pitt Street, an evangelistic preacher, and was connected with the Good Templars Excelsior Lodge (a temperance association), which led to him becoming an Auckland City Councillor in 1880, representing the Good Templars, and defeating the publican's candidate. However, after hearing the inspirational preaching of Mrs HAMPSON he decided to sell his business and depart for America (against the protests of his wife). 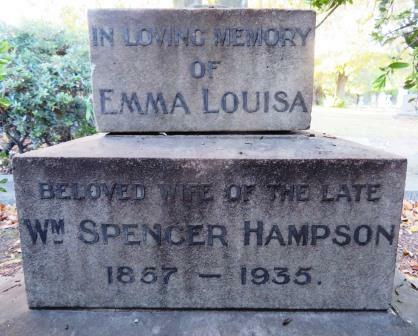 It appears that he actually abandoned his wife and remaining four children, as Mrs HEMUS tracked him down in San Francisco and sued for divorce on the grounds of neglect - which he did not contest, possibly as he wished to marry Mrs HAMPSON. Although no records have been found of the divorce proceedings, the Auckland newspapers reported she was awarded £200 damages and maintenance for the four children, and that she had set herself up running a boarding house in San Francisco, although some reports claimed the family settled in Kansas. [S190] Index - GRO and Office of National Statistics, England & Wales Civil Registration Qtrly Indexes, Birth: District of King's Norton, Vol 18, p435, 1Q1848, mother's maiden name LAUGHER. [S118] Census - 30 Mar 1851, UK census, ED18 HO107-2057 Folio 465 p39 GSU roll 332117-8. [S340] Census - 7 Apr 1861, UK census, ED 17 RG9-2159 Folio 9 p14-15 GSU roll 542927. [S863] Newspaper - New Zealand Herald, issue of 27 Nov 1884, issue 0, Vol XXI. 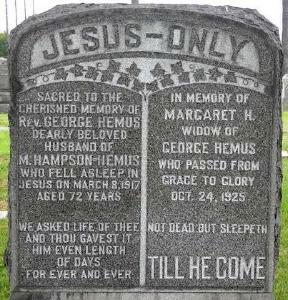 [S871] FamilySearch, at https://familysearch.org/, California, County Marriages, 1850-1952, p157, FHL film 1033135, image 607, digital folder 4540548, his name mis-recorded as HENNES. [S965] National Archives - National Archives, USA, NAI Number 1, Record Group Title M1614, Record Group Number: Naturalization Records in the Superior Court of Los Angeles, California, 1876-1915, certificate 362. [S418] Ancestry.com - misc sources, at http://www.ancestry.com/, California State Library, History Section, Great Registers, 1866-1898,; Collection Number 4-2A, CSL Roll Number 20, FHL film 976929 and CSL Roll Number 22, FHL film 976931. [S259] Census - 15 Apr 1910, US Census, Los Angeles Assembly District 73, Los Angeles, California, Roll T624-82, Page7A, ED 145. 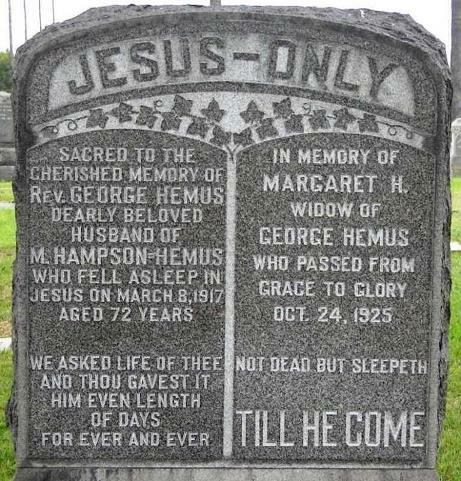 [S1110] Cemetery Marker - George Hemus and Margaret Spencer, Rosedale Cemetery, California, USA, Section D.
[S340] Census - 7 Apr 1861, UK census, ED 14 RG9-3848 Folio 100 p26 GSU roll 543195. [S190] Index - GRO and Office of National Statistics, England & Wales Civil Registration Qtrly Indexes, Marriage: District of Tynemouth, Vol 25, p461, 2Q1850. Marion HENDERSON was born circa 1807. [S189] International Genealogical Index (IGI), Entry M119543/1124, Clackmannan, date of 17th is WRONG. 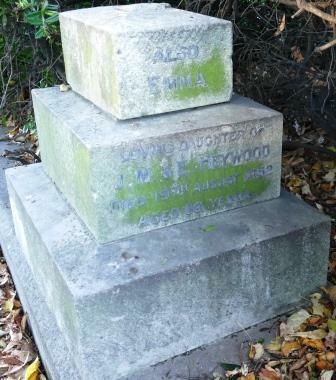 [S453] Book - John Fowler Mitchell & Sheila Mitchell, Monumental Inscriptions pre-1855 Clackmannan. [S753] Australian BDM Indexes 1788-1950, at http://www.ancestry.com/, Tasmania, Reg. No. 660 1898, daughter of Percy Rutherford Henry and Corbetta Chipman. [S760] Newspaper - The Mercury, Tasmania, issue of 21 May 1898, Births. [S760] Newspaper - The Mercury, Tasmania, issue of 24 Oct 1925, Marriages. [S686] Tasmanian Southern Cemeteries database, at http://www.millingtons.com.au/cemetery-records-search/, Record No. C11115, cremation, aged 77. [S1131] MemoryTree NZ, at http://www.amemorytree.co.nz/index.php, aged 73, James R Hill Funeral Disrectors. [S262] Book - Rex & Adriene Evans, Faith & Farming, p390, but gives a 1945 birthdate. [S262] Book - Rex & Adriene Evans, Faith & Farming, p390. [S917] GRO Scotland, marriage record. [S612] GRO Scotland, birth/bapt record, District of Partick, Statutory Births, GRO 646/03 1324. [S917] GRO Scotland, marriage record, District of Partick, Statutory Marriages, GRO 644/14 0316. [S190] Index - GRO and Office of National Statistics, England & Wales Civil Registration Qtrly Indexes, Birth: District of Eastry, Vol 5, p137, 2Q1841, mother's maiden name ELVIN. [S295] Interview - A Robinson, with M Campbell, 22 Aug 2002, who researched Maude McKenzie's diaries; also from D Lang via M Campbell. [S443] CD - NZ Marriages, CD - NZ Marriages 1836-1956 V2, NZ Registrar General's Folio 1401; some disagreement on spelling of bride's second name. [S542] Index - New Zealand BDMs online, at http://www.bdmhistoricalrecords.dia.govt.nz/, Marriage Reg. No. 1864/1627 (bride only). [S542] Index - New Zealand BDMs online, at http://www.bdmhistoricalrecords.dia.govt.nz/, Death Reg. No. 1914/7427, aged 73. [S989] Whangarei District Council cemetery database, at http://www.wdc.govt.nz/FacilitiesandRecreation/Cemeteries/…, Christ Church cemetery, grave 51. [S542] Index - New Zealand BDMs online, at http://www.bdmhistoricalrecords.dia.govt.nz/, Death Reg. No. 1952/32825, aged 89. [S419] Christchurch City Council Cemeteries database, at http://librarydata.christchurch.org.nz/Cemeteries/, Woolston Cemetery, Block S, plot 29. [S542] Index - New Zealand BDMs online, at http://www.bdmhistoricalrecords.dia.govt.nz/, Birth Reg. No. 1857/7039. [S1106] Newspaper - Lyttelton Times, issue of 10 Oct 1857, issue 515, Vol VIII, p4, Births and issue of 16 Dec 1857, issue 534, Vol VIII, p4, Births; father is listed as John, rather than Joseph. [S542] Index - New Zealand BDMs online, at http://www.bdmhistoricalrecords.dia.govt.nz/, Death Reg. No. 1935/23675.